Keep track of the Tattva cycles. Is there a better alternative to TattvaClock? Is TattvaClock really the best app in Religion category? Will TattvaClock work good on macOS 10.13.4? 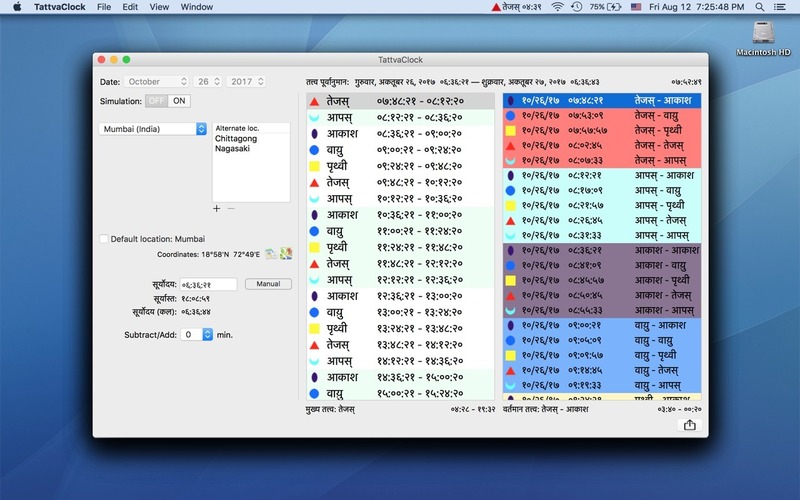 TattvaClock keeps track of the Tattva cycles, showing the exact time when each of the main five Tattvas and their sub-Tattvas start. TattvaClock needs a review. Be the first to review this app and get the discussion started! TattvaClock needs a rating. Be the first to rate this app and get the discussion started! A brief description of each Tattva is given, with its characteristics. Being Tattva a matter of opinion, the author of the software and AsramSoftware cannot guarantee the validity and accuracy of the information given in the application; nor can they be held responsible for the appearance of any inaccurate (ethical, philosophical, religious, etc.) information, or for the use of the information contained in the application.